Erstwhile capital of the Chandela Dynasty, Khajuraho is well known as the temple town. The beautifully carved and decorated temples of Khajuraho are now a UNESCO World Heritage Site. Apart from the temples there are other monuments in Khajuraho which are equally well known. The architecture and design of the Archaeological Museum Khajuraho is marvelous. W E Jardine, the political agent of Bundelkhand displayed objects from the temples in 1910. The display was held near the Western Group of Temples. 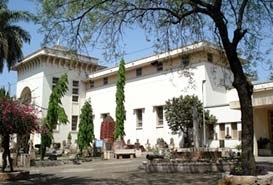 This was initially called the Jardine Museum which in 1952 was renamed to the Archeological Museum. The objects displayed in the Khajuraho Archaeological Museum are sculptures and architectural remains of the 10th and 12th century temples. The objects reflect the influences of Hindu and Jain religions. The museum now houses more than 2000 objects. Among these some of the popular ones are the Nritta Gansha, Uma-Maheshwara, Andhakasuravadhamurti and Vaikuntha.